La grica is a little white house (Greek style) in enchanting position frontsea on the coast road between Otranto -S.M.di Leuca at km 38.200 of S.P.358. The caper is the superior apartment with beautiful partially covered terrace which overlooks the sea and on a clear day is possible to see the mountains of Albania and the nearest Greek islands.It is composed of a double bedroom, a small room with two single bed (a deck-bed), a living room- kitchen and a bathroom with shower. In the living room there is a double bed sofa. The kitchen is very well equipped. 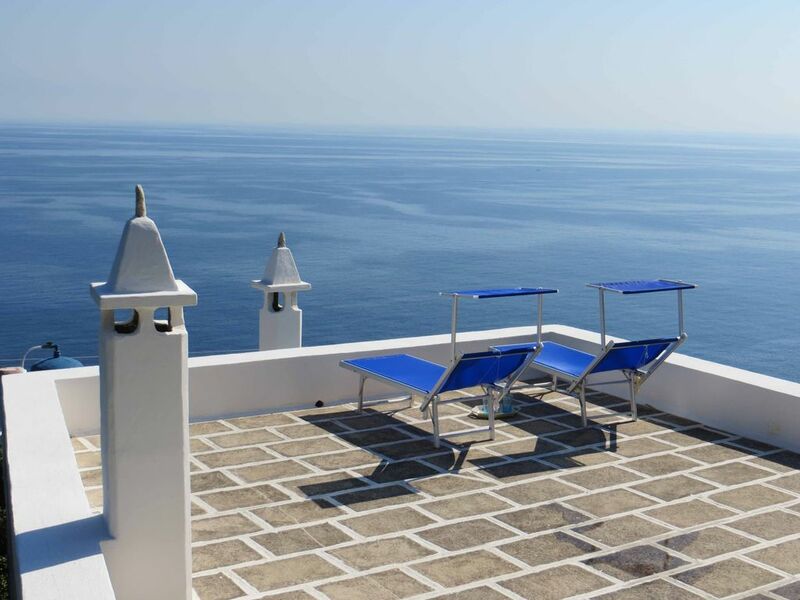 It was called the grica because more than one visitor said that it recalled the houses of the Greek islands. The terrace is equipped with table, bbq, pizza oven, deck chairs, sun loungers, hammock and outdoor shower. There is also the rock garden that slopes with terraces and rocky walls towards the sea. Retired alitalia pilot(jumbo jet), came to the event here, hit by mad passion for the place and now de facto salentinian adopted for 8 months a year. I am sorry for the 3 stars reviews, its the first bad review a received in years. Its not good for our average and this is sad because we really work hard to make our guests feeling at home and having great holidays. for Bedlinens and towels as you knew before we usually charge 15 euro each for 2 towels and bedlinens. We had a beautiful stay at La Grica. When not out taking in the different towns and cities we spent our time outside enjoying the magnificent view of the sea. The bed was great and the kitchen adequately equipped. Livia was very helpful with local restaurants and attractions. Our only regret was 6 nights was not enough. Belle maison avec une vue magnifique sur la mer adriatique. L'appartement était propre et meublé avec goût. Le propriétaire est accueillant et disponible en cas de besoin. Il y a la possibilité de visiter de nombreux sites intéressants, d'aller se baigner ou de rester tranquille sur la terrasse. Nous avons passé mon mari et moi un très beau séjour, car nous aimons le calme et la nature. grazie patricia per la bella recensione testimonia come la grica offra bellezza e tranquillità. Spero di riavervi miei ospiti. Questa vacanza ce la siamo proprio meritata!!! La casetta è veramente carina, comoda e con una vista impagabile. Unico neo….una piccola lavatrice nel bagno sarebbe una grande cosa!!! Comunque merita il viaggio da incubo per arrivarci…..da Genova e Rapallo!!! La Grica is a very nice place with a wonderful terrasse and perfect view. Livia and Bruno are very reactive and helpful. The apartment itself is simple but aim is to spend time outside: on the terrasse or discovering the fabulous surroundings :-) Thank for the given tips! Ottimo rapporto qualità / prezzo per questo studio. Vista molto bella sul mare Adriatico. Posizionamento interessante per visitare la Puglia, in particolare il tallone estremo del bagagliaio. Lo studio è perfettamente funzionante, dotato semplicemente. È molto carino, bianco e blu stile greco. La terrazza è davvero bella per il pranzo contemplando il mare. È possibile parcheggiare di fronte allo studio senza difficoltà, il posto è riservato. Livia il proprietario è disponibile su richiesta, vive non lontano e il suo consiglio è apprezzabile. Ha anche abbandonato alcune pasticcini locali sul tavolo per il giorno dopo il nostro arrivo in ritardo, che abbiamo apprezzato molto. Alcuni punti da migliorare: il segnale Wi-Fi molto basso anche se non ne abbiamo veramente bisogno, questo può essere uno svantaggio per altri host. Anche la biancheria da letto composta da 2 materassi incollati gli uni agli altri potrebbe essere sostituita da un vero e proprio materasso doppio. Altrimenti consigliamo vivamente questo posto :) Grazie Livia! Lecce, Tricase, then the coastal road towards SM di Leuca at Km 38.100. The rituals, festivals, shows and the memories of this earth that combines culture and tradition, sacred and profane, Christianity and Paganism and that found in the patron saint the item to venerate and worship. During the period from 15 July to 31 August all the villages of salento celebrate their festivals, some sacred (religious procession), others pagan with music and dancing. In these festivals you can eat the food cooked by the women of the village, but what is more surprising is that all (old, young people and children) are in square dancing to the rhythm of overwhelming pizzica (an ancient dance of courtship). To see the “pizzica dance” or “la notte della taranta a Melpignano” to go on "youtube".